It has to be said that these days it can be very difficult to differentiate between a counterfeit DVD and the real thing. The manufacture of the items - mainly in Asia - has become exceedingly good, and it's easy for the average consumer to be fooled. That said, there are some giveaway signs - albeit not in every case. A few will be quite obvious. 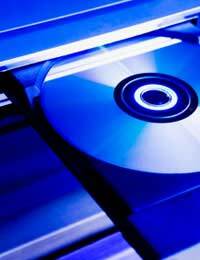 A disc sold with no case (which might be described as a so-called rental return) is a fake, as are (quite obviously) those which are blank discs with the title simply written on. Price can also be an excellent indicator in many cases. Where something is selling for, say, £2, and it's £14 in the shops, the odds are that it's not legal (although there might be a few, rare exceptions). Also, where a film is still playing in theatres and you find it for sale on DVD, it's a strong bet that it's counterfeit (again, that's not always the case; it could be from another country where it's already on DVD, although that's becoming less and less likely as international release dates are more coordinated). By itself, the fact that a DVD might be from Asia doesn't automatically make it a fake. However, it should raise a red flag for any buyer, especially in an online auction. Check the seller's feedback carefully, not just the numbers, but also the comments. If any indicate he was selling fakes, however well they might play, steer clear. A lot of commercial releases, certainly those by major studios, are for a specific region (i.e. Region 1, Region 2). The big studios will not be putting out movies marked Region 0 - meaning the DVD will play on all players. That said, a lot of Asian releases, especially anime, are Region 0. You need to know the type of movie you're dealing with, and the more you know about different releases of the film, the better. There should be no misspellings on the cover text, and the images should be very clear. However, the quality of printing on fakes has improved dramatically, so the cover alone might tell you nothing. The playing side of the DVD - the underside - should be silver. On the other side, under the printing, you should not be able to make out the name of the manufacturer of the disc. If you encounter either of those, you've found a fake. When dealing with anime, which has become an incredibly popular genre, especially among the young, and where most discs come from Asia, it becomes even more complex. Here's it's very much a case of knowing your movies and editions and doing careful research to see what's legitimately available - and be especially careful on subtitle languages. In a number of cases the fakes will use different languages to the real versions, to capture a larger market. Where the discs, typically a box set, are made up of episodes of a show, a legitimate release will really never have more than five episodes on a disc. If you see a lot more crammed on, then it's almost certainly a bootleg. I work as a volunteer for Save the Children and run the cd/dvd department at my local branch. I have noticed free with magazines and news papers that they do not always play and scratch easier than bought ones. These free cds / dvds are actually considerably lighter than bought ones. Recently there have been some cds /dvds donated to us that have been in a sealed clear bag. Looking at them they appear to be normal but one of my customers has said they are likely to be fraudulent copies. Has any one come across this before and were they found to be fraudulent copies I take pride in my work and have no wish to tarnish Save The Children's good trading reputation.All cds/dvds which I sell are thoroughly cleaned and if nesasery put into replacement jewel cases to make them of merchadiceable quality.